Once again I have to do a little Oregon bragging about my Senator Ron Wyden. He’s been concerned about the shadier side of our War on Terror–including drone strikes and intelligence collection–for a long time now. You could say he was into this stuff before it was hip to do so. The Senators do not specify exactly which part of the website factsheet is inaccurate, as this is classified information, but they do add a classified attachment to the letter for review by the NSA. Sen. Wyden, who is on the Senate Intelligence Committee, has been dropping hints about his worries for a while now, even while he could not publically discuss the problems with the NSA. It’s nice to watch him continue fighting, but it’s sad to say that the tide in Congress is very much against him. Ha! Edward Snowden is still at the Moscow airport, and Vladimir Putin is defending himself from American charges that he is helping hide a criminal. Putin says that Mr. Snowden’s arrival was “a complete surprise for us”. This would all be very nice except that the Guardian reported a few days earlier that Russia offered to consider a political asylum request for Snowden as soon as he fled the U.S., even though Snowden had not submitted any such request to them. They immediately volunteered themselves as a possible location for him…but now Putin is completely surprised by this turn of events! Perhaps he is just amazed that anyone would actually take him at his word? 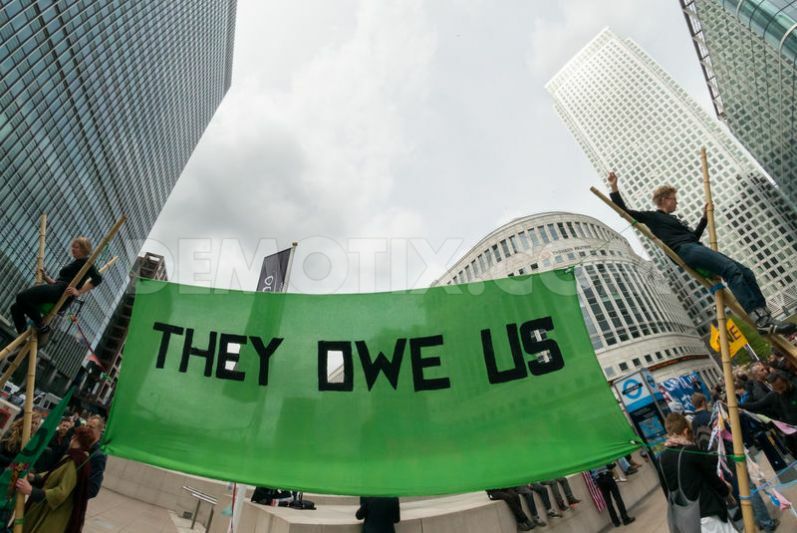 I love the name of this protest against the G8–“They Owe Us”. Because as the protesters also ask, “Whose Debt?” It’s nice to see somebody still remembers those huge bailouts. Because–at the risk of getting accused of being one of those class warfare people–isn’t it just a little ironic that the powerful of the world are discussing the weak outlook for the global economy at a posh resort with a sprawling golf course? Yeah, the outlook for the rest of us out here *is* weak, thanks for remembering that. The NSA scandal has messed everything up. I’m accustomed to all the usual suspects supporting each other on their respective sides of the battle, but alliances are splitting up on both the left and right, and my political spidey sense is going out of whack. Now Rand Paul is getting ready to file a civil suit against the NSA, and he will find support for this action from both the ACLU and–if it gets to the Supreme Court–from a sympathetic Sonia Sotomayor. This has to be the first time I have ever seen an article from a Cato Institute author praising Justice Sotomayor for anything she’s done. Sen. Paul disagrees with fellow Republicans like Rubio and McConnell about this, but does agree with Michael Moore. Even worse, I find myself agreeing with Rand Paul and disagreeing with President Obama in this situation. Time for cats and dogs to start mating, and the Apocalypse to happen. Here’s a great example of why the IRS scandal has opened up a huge can of tax-exempt worms. One of the groups complaining about getting extra scrutiny is the Citizen Awareness Project of Colorado. Less than three weeks before Election Day, a new mystery group dropped nearly $1 million on an anti-Obama expenditure, according to records. Citizen Awareness Project appears to be a nonprofit organization. It reported the independent expenditure opposing President Barack Obama Thursday, according to a filing with the Federal Election Commission. The group helped make marketing materials for the Heritage Foundation, among other things. Why *should* an organization like this be tax exempt, when it is so clearly political? I don’t want groups whose main purpose is to support either liberal or conservative candidates to receive a tax exemption. The main goal of a tax exempt nonprofit is supposed to be social welfare. According to the above article, the treasurer of Citizen Awareness Project is a law clerk who specializes in election law. This is not a group focusing on social welfare of any sort. For an extra helping of what can only be viewed as strange sarcasm at this point, there are plenty of conservative postings from 2011 and 2012 complaining about the tax exempt status of Occupy Wall Street. Yeah, it does seem ironic now, doesn’t it? I think neither side should be able to get away with taking advantage of tax loopholes. I’ve gotten used to the fact that we all have to live in the middle of a big, dirty political fight…but at least make the participants pay some taxes!